One of the most important prerequisites to enjoying good health and sound well being is having an effective immune system. Without an immune system operating at the top of its game, you will fall foul of many diseases and illnesses, from the common cold, to cancer. So how can you ensure that your own immune system is firing on all cylinders? Well, the answer is that you must first create the right environment within your body – an environment that gives it everything that it needs to prosper. The acidic state of your body is referred to as its pH balance, rather like a swimming pool, and in actual fact, given that our bodies are made of 80% water, it’s quite a good analogy to draw. To have a balanced or neutral pH, your body’s pH level should register 7.4 pH; anything lower than that, and your body environment will be too acidic, and anything above that, it will be too alkaline. Do you remember at school when you used Litmus paper to measure for acidity? If so you’ll probably remember that blue Litmus paper turns red when exposed to acidic solutions, and red Litmus turns blue when exposed to alkaline solutions. It is this same balance of acid or alkaline that is important to your body and its immune system. The reason that having too much acid in your body’s chemistry is bad for you is that it makes your body go in search of certain minerals, which, when it finds them in your organs, your bones and your teeth, it then proceeds to rob them thereby weakening the hosts from which they have been taken. In reality this is quite a common situation and many people accordingly suffer from a mineral deficiency which can go on for years before it is finally spotted. The name given to this condition of excess acidity is Acidosis, and as well as impairing the efficiency of your immune system, it also manifests itself in other ways. For example it lessens the body’s capability to ingest various nutrients and minerals. It can also increase your chances of becoming susceptible to illnesses such as rheumatoid arthritis, diabetes, tuberculosis, osteoporosis (brittle bone disease), hypertension, and cancer. In addition, Acidosis decreases the amount of cellular energy in your body as well as interfering with its ability to reproduce new cells. In other words as old cells die, (and they will do so in increasing numbers because of the low energy) they will not be replaced. But this is only the tip of the iceberg. Prolonged Acidosis also means that you will tire more easily; you may also suffer from headaches, insomnia, breathing difficulties, heart palpitations, and the skin on both your hands and your feet may feel hot and dry. But one of the most dangerous things that Acidosis does is to create an environment that encourages and supports the growth of abnormal cells – cancerous cells! So all in all it is plain to see how undesirable it is to have a low body pH count, or Acidosis. Given the serious nature of the problem, you should prioritize establishing your body’s pH level; it is not difficult to do. 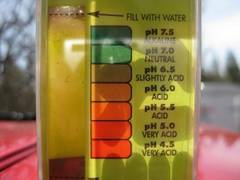 The easiest way is to measure the pH levels of either your saliva, or your urine. You can buy pH test strips which you simply dip into one substance or the other. They are general available in many health and wellness stores, but if you have any difficulty you can track them down very easily on the web. They are not wildly accurate, but they will give you a good indication of where your pH level is at. For a more accurate reading you should visit your doctor and he/she can run a simple blood test for you. The most effective way of influencing your body’s cell and tissue pH level is through your diet. To rid yourself of chronic Acidosis may not however be quite as simple as it sounds. There are many natural foods that are recommended for “Alkalizing” your body system, things like avocados, chick peas, potatoes, lemon juice and red capsicums; but one of the problems is that when ingested, many of these foods lose their alkaline properties. To maintain health, the diet should consist of 60% alkaline forming foods and 40% acid forming foods. To restore health, the diet should consist of 80% alkaline forming foods and 20% acid forming foods. Generally, alkaline forming foods include: most fruits, green vegetables, peas, beans, lentils, spices, herbs and seasonings, and seeds and nuts. Generally, acid forming foods include: meat, fish, poultry, eggs, grains, and legumes. Too few people fully understand the significance of maintaining a good pH balance in their body systems. The closest many people come to being aware of the existence of pH are swimming pool, and swimming pool service technicians. If the pH balance of a pool is low, it means that the water has become too acidic, and the result for bathers is sore, burning eyes and noses, dry itchy skin, and swimwear that that loses its elasticity and becomes bleached. The opposite condition, (i.e. water with a high pH balance, meaning that is has become too alkaline) has similar effects on the human body. But when your body system pH levels get out of balance, the result can be even more drastic because it affects your immune system. It is a scientifically proven fact that when your body pH levels become too acidic (a condition known as acidosis), you are much more susceptible to falling ill. It’s all about looking after your body’s internal environmental condition. By providing a clean environment for your body cells, you are giving them the very best protection against becoming diseased, and remember, all illness starts at cellular level. In order for your body to have a healthy pH balance, it should measure 7.4 on the pH scale. But how do you go about measuring it? Well in actual fact it couldn’t be easier. All you need to do is to obtain a testing kit from your local pharmacy or, if you prefer, you can buy them online. The kit consists of a set of small pH balance test strips. All you need is a small sample of either saliva or urine. You then take 1 test strip and dip the end in the body solution you have chosen to test. The end of the strip which has been immersed will then change colour. Next, simply take your test strip and compare it to the colour chart that is also a part of the kit you bought. The colour chart is coded with the pH levels that correspond to the various shaded colours. Whilst these tests are not the most accurate way of measuring your body’s pH levels, (you should go to your doctor and arrange a blood test for spot-on accuracy), they will at least give you a more than good indication of where your level lies. When testing your saliva or urine you will need to be aware that they will give different readings as both solutions are produced in different ways and have different optimum ranges. Let’s take saliva first. The natural optimum reading for saliva is 7.5, which means that your body is slightly alkaline – perfect! Please note however that you should wait until 2 hours after eating or drinking to carry out your test. Also, to get the best view of how your body is performing, you should do three tests throughout the day. Simply spit into a spoon, dip the test strip in the spittle, wait a few seconds, and then simply match it up to the colour swatch. Your diet will significantly affect your body’s pH levels. As you might well expect, the bad foods, (Burgers, chips, Cola, chocolate, sweets etc), are so called “acid” foods and will raise the acid level in your blood, whereas the good foods, (fresh produce, green leafy vegetables, salads, nuts etc), are “alkaline” foods and will help to maintain a more alkaline aligned pH level. Given how important your pH levels are, and how simple and inexpensive the test kits are, you should be sure to test yourself from time to time to ensure that your system is not too acidic. A carefully balanced pH state is your best way of avoiding illness. Check it out now! For testing urine, let some urine flow before testing as this will give more of an average reading. It is also a good idea to test 2-3 times in a day in order to get an average, as first thing in the morning the body has retained fluids over a long period of time and it will engage in different processes to remove acid wastes from the body throughout the day (depending on activity and diet).